Fifteen water stressed districts of Odisha will be covered under ground water recharge and solar micro irrigation projects at an estimated cost of Rs 1,150 crore, the first of its kind in the country to ensure food security in vulnerable tribal areas. The Green Climate Fund (GCF), an international institutions will provide a grant of Rs 232 crore through NABARD and Rs 870 crore will come from the state government’s convergence fund while the World Bank would provide around Rs 50 to 60 crore for the implementation of project, said water resources dept secretary Mr Pradip Jena. 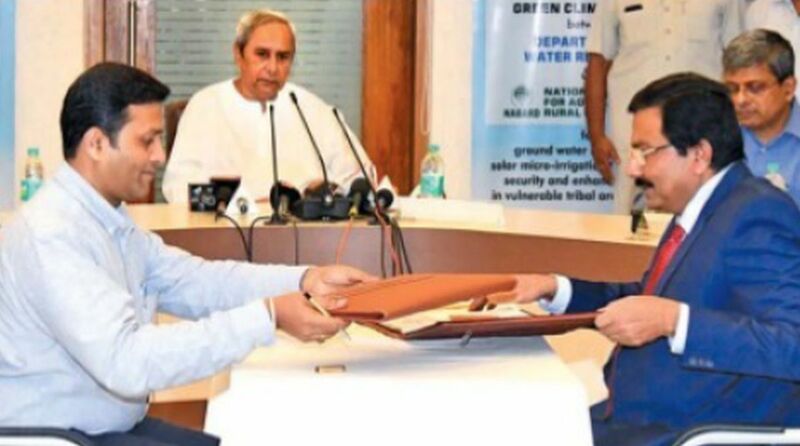 A Memorandum of Understanding (MoU) was signed today between Water Resource Special Secretary Vishal Gagan and NABARD CGM K C Panigrahi in the presence of Chief Minister Naveen Patnaik. Chief Minister said it the first project in the country from the Green Climate Fund, based in South Korea. Apart from renovation and improvement of 10,000 thousand water tanks, the project envisages providing recharge shafts to recharge at least one lakh sixty-five thousand acre feet of water to the aquifers, development of 1000 deep bore wells with solar pumping based micro irrigation and capacity building of farmers, he said. The project will be implemented in five years. He hoped that NABARD, Departments of Water Resources, Panchayati Raj & Drinking Water and Forest & Environment to work together to create a model for adaptive action. Water Resources Secretary P K Jena said the state government has submitted a proposal to the green Climate Fund (GCF), for funding to augment the ground water resources by renovating 10,000 existing ponds and installation of recharge structures. The ground water would be utilsied for irrigation to ensure food security by installing solar based pumps for micro irrigation in 1,000 ponds which included 9000 ponds of Gram Panchayats and 1,000 Ponds under micro-irrigation. The 15 districts of the state covered under the project are Baragarh, Bolangir, Boudh, Gajapati, Kalahandi, Kandhamal, keonjhar, Koraput, Malkangiri, Mayurbyanja, Nuapada, Nabarangpur, Rayagadada, Sambalpur and Sonepur. Jena said two volunteers would be appointed for each tank to monitor the ground water level and advising people for water conservation and its judicious use. On completion, the project would increase resilience of health and well being of about 12 million vulnerable communities, through water security, reduce food gap through resilient crop planning, enhanced crops and save energy.